dreaded at least one Monday in your life you either haven't started potty training (and therefore probably can't read this), you make a million dollars a day or you don't work. 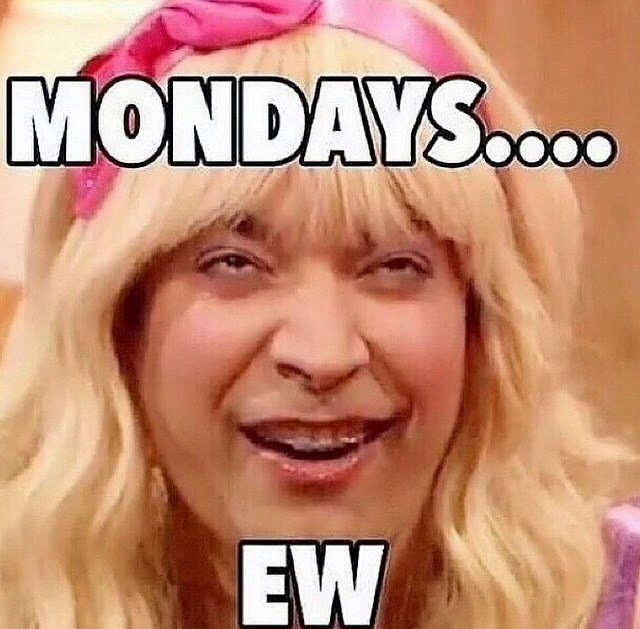 Let's be real, MONDAY'S ARE HARD! After spending two beautiful days reconnecting with your bed, working out at any time of the day and getting to stay up past 10pm, Monday can quickly become your arch nemesis! I spent my weekend reconnecting with my friends, not working out and instead eating home cooked meals with my wonderful parents and I barely slept because I was too busy dancing until just before the sun came up. It's safe to say that this particular Monday is going to be tough. Not only did I have a great weekend celebrating two of my friends saying "I do," but I have a really full week of work starting first thing Monday morning. This brings me to my questions...didn't we just have a Monday last week? You survived the last Monday. Trust me, you can do it again. How do I know? Because you're a survivor! (if you need more inspiration watch DC' video and put a fan on you to get Beyoncé's wind blown hair). You only have three sleeps until the next episode of Scandal. (get your wine glass warmed up with a glass or two tonight). You have the "ohhh it's a Monday" excuse if you are a couple of minutes late to work and everyone will understand the struggle. You only have 44 days until Christmas (on this particular Monday). You have all those fun weekend event memories to make you smile throughout the day. Like that one time when you got a hype man and she screamed "yeah" after everything you said...for 3 hours. You have a whole extra day of football...my fantasy team better show up tonight. You have something to wake up for and if you dread Monday it (probably) means you have a job. I bet there are a lot of people out there who would be happy to have a job to go to on a Monday morning. You get a fresh start to a whole new week. Did you have an awful meeting last week? This is a new week and another chance, make the most of it. Instead of dreading Monday, I'm going to try to remember all the great things Monday means. I'm so thankful to be alive, to have a career and to have another Monday. Take a minute to remember that we are so lucky to be alive today and everyday is a blessing...even the Mondays.